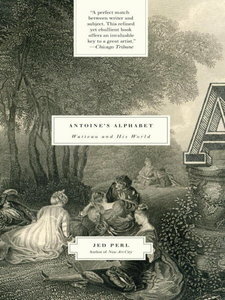 Perl Jed, "Antoine's Alphabet: Watteau and His World"
Antoine Watteau, one of the most mysterious painters who ever lived, is the inspiration for this delightful investigation of the tangled relationship between art and life. Weaving together historical fact and personal reflections, the influential art critic Jed Perl reconstructs the amazing story of this pioneering bohemian artist who, although he died in 1721, when he was only thirty-six, has influenced innumerable painters and writers in the centuries since—and whose work continues to deepen our understanding of the place that love, friendship, and pleasure have in our daily lives. Perl creates an astonishing experience by gathering his reflections on this “master of silken surfaces and elusive emotions” in the form of an alphabet—a fairy tale for adults—giving us a new way to think about art. This brilliant collage of a book is a hunt for the treasure of Watteau’s life and vision that encompasses the glamour and intrigue of eighteenth-century Paris, the riotous history of Harlequin and Pierrot, and the work of such modern giants as Cézanne, Picasso, and Samuel Beckett. By turns somber and beguiling, analytical and impressionistic, Antoine’s Alphabet reaffirms the contemporary relevance of the greatest of all painters of young love and imperishable dreams. It is a book to savor, to share, to return to again and again.